As recently as some 30 years ago, there were times when there was not enough blood to go around in Singapore. So some nurses "played God" and decided which patient to give the blood to, depending on how urgent each case was. "We tried to gauge the urgency based on the clinical condition and haemoglobin level of each case. 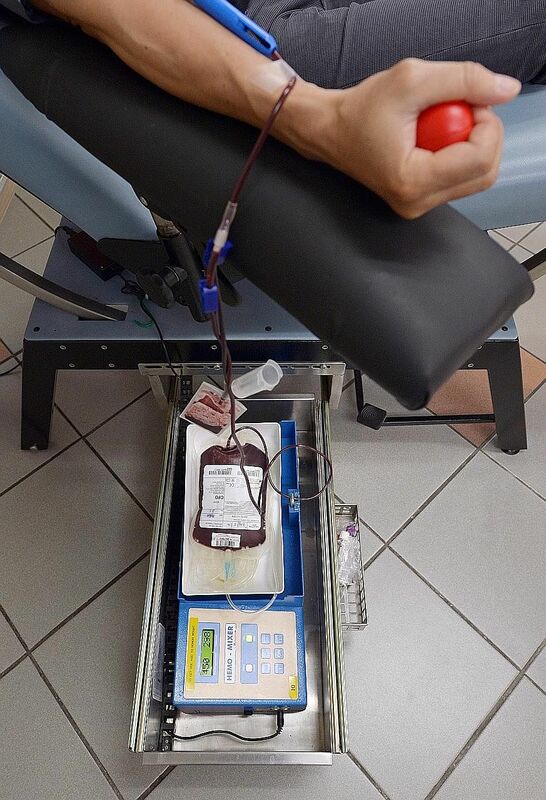 It was a painful process because for any wrong decision made, the patient could die," said Dr Tan Hwee Huang, 59, assistant group director of blood services at the Health Sciences Authority (HSA). She was a young medical officer then and the blood bank had a reserve of only about 20 packets of blood. Those times were so stressful that Dr Tan often lost sleep. "I couldn't sleep and the next morning, I would call the hospital to check whether the patient, whom we didn't give blood to, was still alive," she said. Since then, blood banking and blood services in Singapore have progressed tremendously. Though the demand for blood has surged over the years, more people have also been coming forward to donate. This year marks the 70th anniversary of the country's national blood banking service since it first started with the then General Hospital compound in Outram Road in 1946. From its modest beginnings as a transfusion service run by just two doctors and two volunteers, blood donation has become a more extensive affair today. There are now four blood banks and there are plans for another in the east to cope with the rising demand due to an ageing and growing population. Besides making it more convenient for people to donate blood, HSA strove to ensure that the blood donated is safe and of good quality. In 2000, Singapore was one of the first few countries to adopt nucleic acid testing for infectious diseases such as hepatitis C and the human immunodeficiency virus, which causes Aids. In 2006, Singapore was the first in Asia to be certified to meet the international standard for quality of blood. For a country that used glass bottles and rubber tubing to collect blood from the post-war years until 1965, the transition is stark. Today, people can easily book an appointment online to donate blood and fill in a health questionnaire beforehand so they can see the doctor or nurse almost immediately after they arrive at the donation centre. In the past, people walked in with donation cards that had their records listed manually. Those who donate blood in external blood drives held at office buildings, for instance, can now relax on cushioned chairs in a seated position. In the past, foldable canvas beds were used so donors had to lie on their backs and face the ceiling. The use of technology in blood services has gone beyond equipment changes or computerisation. HSA is looking to roll out a "live" tracking system to manage blood products from the moment they are collected to the time they arrive at hospitals, by using radio frequency identification (RFID) tags. This will allow HSA to check the number and location of the blood packs or whether the blood has been transfused. If the blood stocks in one hospital are not being used, HSA may move them to another hospital with more urgent needs. The RFID system will also trigger alerts when blood products are about to expire, or if the wrong bag of blood is retrieved for a patient. Keeping up with technology and the latest research also helps HSA to maintain blood safety. "One of the key challenges going forward is ensuring that the blood supply remains free of infectious diseases despite globalisation and frequent travel," said Dr Tan. Other challenges include ensuring a constant supply, as demand for blood is rising and expected to reach over 220,000 units by 2020. Last year, 109,190 units of blood were used for medical transfusions. "The development of artificial blood is still in the experimental stage and would take 20 more years at the very least. Even if it is available, it will be expensive," said Dr Tan. "We hope people will continue to donate blood consistently because you never know when your loved ones may need it."